On the 10th of July the cyclists of promo tour EuroVelo-4 visited Shepetivka. The tour started in Kyiv, the end point will be in Krakiw. The whole itinerary is more than 800 km. EuroVelo is the European cycle route network, is a project managed by the European Cyclists’ Federation in cooperation with national and regional partners. It currently consists of 17 routes. EuroVelo4 goes through Shepetivka. On 7 July in Kyiv starts the cycling promotional tour EuroVelo4 Ukrainian part of the route. The final point is Krakow, Poland. 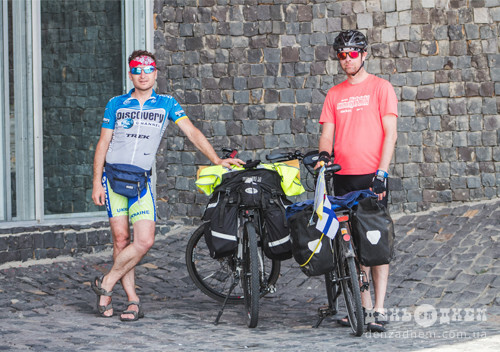 The promo cycling tour, organised by the coordinator of the project "EuroVelo in Ukraine" Olexandr Papirnyi and the cyclist from Finland Mark.The main goal of this cycling tour is promotion of EuroVelo route in Ukraine. I enter Ukraine almost at dusk and for the first 50 km I can’t see any difference. In August 2013, Kyiv Cyclists' Association, the National EuroVelo coordinator for Ukraine, held a field trip to explore a 350-km stretch of the planned EuroVelo-4 Route in Western Ukraine. The trip that covered four provinces stared in Shepetivka, a mid-size city located about halfway between Lviv and Kyiv. From there, the team of cycling enthusiast moved westbound, sometimes splitting in two groups to check various potential routes. The group, composed of 5 volunteers from Kyiv, Radomyshl, Khmelnytskyi and Yaremche, was pedaling about 80-100 every day, documenting its way and discovering local communities and tourism infrastructure. In June 2013, a group of cycling activists from the town of Radomyshl led by Alex Papirnyj made a field trip to test three optional routes connecting this town with the city of Zhytomyr. As a result, the most optimal route was selected and recommended to be used as EuroVelo4. It runs south of the E-40 motorway to the town of Korostyshiv. where it takes north-east to Radomyshl.